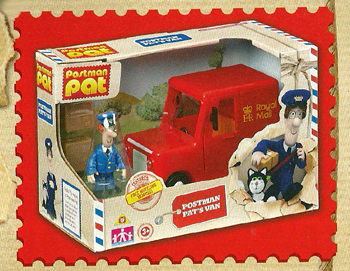 It has been confirmed that master toy licensee Character Options are to release a brand new range of Postman Pat toys in 2013. The new range of Postman Pat toys is set to coincide with both the release of the Postman Pat movie and a new series of the show airing on CBeebies. New vehicles will include Postman Pat’s Quad Jeep Pat 7 and a high speed train called the Pencaster Flyer. There will be new plush lines including a must-have interactive Jess plush toy Stroke and Purr Jess and a movie-inspired interactive Showbiz Pat Singing and Dancing Postman Pat as seen in the new movie. Existing toys are being repackaged to resemble the actual parcels and packages that Pat delivers. Hopefully the new toys will debut at the London Toy Fair in January 2012. The long-anticipated new Postman Pat movie is set for release on May 24th, 2013. There will also be 26 brand new episodes of Postman Pat when SDS Series 2 airs this year. This entry was posted in News, Postman Pat Toys on June 28, 2013 by pmptTT5.